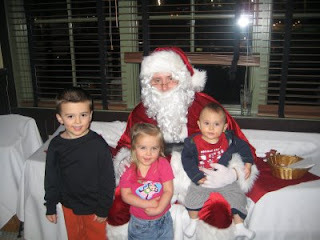 Even though the bad weather made it hard to get out Tuesday night, we all still could not miss dinner with Santa Claus! 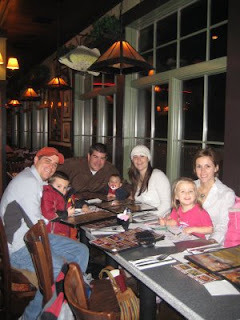 We met up at Uno’s Pizzeria at 5:30 to see Santa Claus and have a great dinner at Uno’s. Chase, my nephew, came in running to tell Santa Claus about the spy gadgets he wants for Christmas. Adeyln was a little shy, but warmed up quick after seeing Brody (my son) get up there giggling when Santa Claus sat him on his lap. We were seated right next to the window where we can overlook the lighted tree outside! My neice and nephew were amazed to see Santa’s sleigh parked in the rafters of Uno’s ceiling. But of course, were wondering where exactly were his reindeer (eating grass outside by the tree)! Dinner was great, I split the triple mushroom cheeseburger with my mother and enjoyed some French onion soup (best in town)! Service was great and we even got a chance to speak with Bill Ingram (Uno’s general manager). LaDonna (Manager) stopped by our table to wish all of us a Happy Holiday! This will definitely be on our calendar for next year. Wisp’s 53rd Birthday Celebration Bash! 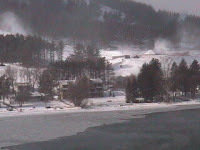 Wisp Resort Celebrates 53 Years of Skiing! 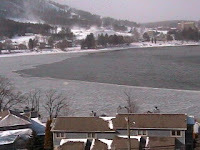 Wisp Resort is celebrating its 53rd Birthday on December 14 & 15, 2008 with discounted lift tickets, lessons and rentals, plus birthday cake, games and entertainment. 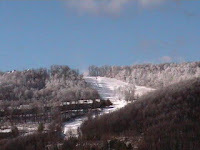 On Sunday, December 14, 2008 and Monday, December 15, 2008, Wisp Resort is offering a $7 one-day lift ticket or a $14 2-day lift ticket, along with half price sport ski and snowboard rentals and half price group lessons. 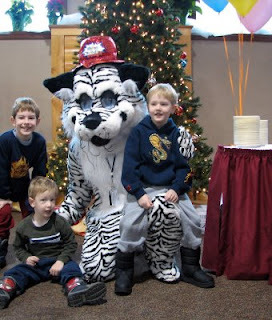 A Saturday-Sunday-Monday, extended day lift ticket valid December 13 – 15, 2008 is $46 per adult and $39 per junior. In addition, Wisp Resort will feature entertainment with music provided by DJ E.J. from 11am – 5pm on Sunday and 9am – 2pm on Monday. DJ E.J. will also be entertaining with games and prizes from 1pm – 5pm on Sunday and 10am – 2pm on Monday. Wisp is offer complimentary Birthday Cake service on Sunday and Monday at 1pm in the Main Lodge, while supplies last. Opened during the winter of 1955/56 under the direction of its founder, Helmuth Heise, Wisp has evolved from a rope tow and one room building with pot belly stove into one of the premier 4-season destination resorts in the Mid-Atlantic region. Since 2001, Wisp Resort has undergone more than $45 million dollars in renovations, additions and improvements including the addition of the Mountain Coaster and North Camp-the largest terrain expansion in Wisp’s history. Future plans include ski terrain expansion, a mountaintop village, retail shops, restaurants and more skier services. Wisp Resort lies in the heart of Garrett County, Maryland’s westernmost county. Wisp Resort is less than a 2-hour drive from Pittsburgh, 3-hour drive from the Baltimore / DC Metropolitan area and less than a 45-minute drive from Morgantown, WV and Cumberland, MD. From Europe to North America to Asia, people began using snowshoes over 3,000 years ago out of basic need to find food and explore new territories in the wintertime. Snowshoeing flourished among the native people in North America. Before long, savvy European trappers, hunters, explorers and surveyors adopted snowshoes as their own. Snowshoeing is as easy as walking; today’s compact, streamlined frames and asymmetric shapes enable snowshoers to have a normal stance and natural stride. In an ascent or an incline (in contemporary snowshoes) your toe hinges freely from the bindings which give you more friction and better grip. At the same time, the tail of the snowshoe drops parallel with ground to lessen leg fatigue. In a descent or decline, the proper technique to maintain balance is to lean back and “ride” the heel section of the snowshoe. State parks, national forests, community recreation areas, nature centers, alpine and Nordic resorts, private woodlots, even your own backyard all provide new winter experiences via snowshoes. Park rangers, chambers of commerce, college outdoor clubs, regional snowmobile associations, and winter resorts are excellent sources of information and areas to explore on snowshoes. Warm, dry feet are essential to having fun in any winter sport. Choose waterproof hiking boots with gaiters for good ankle sport if you’re planning an extended hike in variable, or steep terrain. For a more casual snowshoe outing, insulated pack-style boots, rubber boots, or hiking footwear will work. Wool socks, with a silk or comparable liner against the foot, will absorb moisture and prevent chilling. Layers are the proper dress for this aerobic activity. Be prepared to be quite warm when trekking and to cool off quickly when stopped. To dress for comfort, choose lightweight, breathable long underwear, with wind absorbent layer of insulation – sweater or fleece – topped with wind resistant outerwear. Remember, warm head gear will conserve body heat and prevent chill.